Bengaluru-based Leap Media and Entertainment has carved out a platform under the banner ‘Mug to Mike’ for amateur singers and has scheduled its first round of auditions in Belagavi on May 14 and 15 at Dr. B.S. Jirgi Auditorium on KLE University campus in Nehru Nagar. KLE Society’s College of BCA and MCA is collaborating with the Leap Media on the event. The different audition categories will be: Film and Non-film songs; Instrumental (percussion & non-percussion), Lyrics and Band. Special prizes will be given to unique and creative performers. 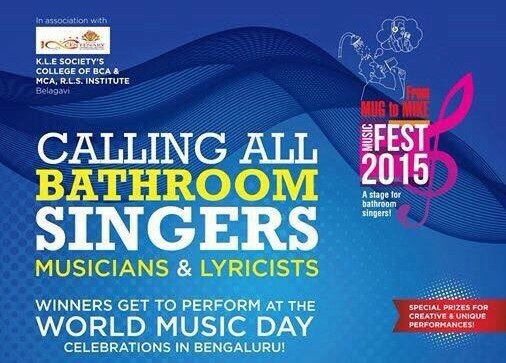 At the grand finale, there will be a ‘Bathroom Singers Marathon’ from 12 noon till 5 p.m.
Singers, musicians and lyricists wishing to participate in the auditions may call 98452-86308.